The sales of Gran Turismo 5 in Japan could prove that driving cars trumps piloting mechs in the region. 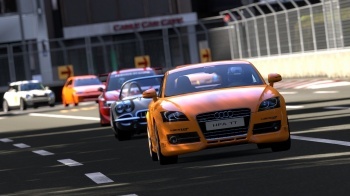 After more than 5 years of development, Gran Turismo 5 was finally launched worldwide at the end of the third week of November 2010, and its early sales figures were very strong in Japan. The game is on its way to earning back at least some its $60 million budget. Gran Turismo 5 sold 430,707 copies in its first week on shelves in Japan, which includes the sales of Japan's shiny blue Gran Turismo 5 PlayStation 3 bundle. PlayStation 3 consoles also saw a boost in sales for the same week, roughly doubling the previous week's sales with 68,840 total units sold. Gran Turismo 5 was priced at Â¥7,980 ($95) and the PS3 bundle cost Â¥35,980 ($427). Notably, Gran Turismo 5 beat out Super Robot Wars L in its first week, the latest entry in the giant mecha series which sold 129,054 units. The gravity of this is not lost on me, as Japanese gamers tend to love giant robots, but driving won out in this battle. It's not like Super Robot Wars L is a Gundam game or anything (though there are Gundams featured), and there are a ton of games in the series, but the fact remains that driving trumped giant robots. Go driving. Polyphony Digital head Kazunori Yamauchi is probably very happy that he was able to sell a game where players have to realistically manage their braking into a chicane over one that has players wielding laser swords and firing missiles. However, the PSP was still king of hardware sales in the region, and with the brand new Monster Hunter Portable 3rd just released on the handheld in Japan on December 1, it's not assured that Gran Turismo 5 will have as good of a following week. Racing and collecting cars in Gran Turismo 5 might be fun, but aside from Dragon Quest I don't think anything can beat Monster Hunter frenzy in Japan.